Rush: Beyond the Lighted Stage (Directors: Sam Dunn and Scot McFadyen): Toronto directors Dunn and McFadyen’s previous efforts Metal: A Headbanger’s Journey, Global Metal, and Iron Maiden: Flight 666 were solid, if unspectacular, examinations of various aspects of the world of heavy music. With Rush: Beyond The Lighted Stage, they’ve taken their game to a new level, presenting a fascinating portrait of the Canadian rock icons that will please fans and non-fans alike. Fresh off winning the audience appreciation award at the previous week’s Tribeca Film Festival, Rush: BTLS made its Canadian debut at Hot Docs, which only seemed appropriate considering the number of Toronto and Southern Ontario references and amounts of local footage used in the film. Dunn and McFadyen were granted unprecedented access to the band and their archives, unearthing previously unseen pictorial gems and old videotaped performances of some of the band’s earliest performances, including one showing them playing a high school gig with original drummer John Rutsey. 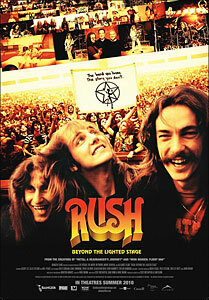 Extensive interviews with bassist/lead vocalist Geddy Lee, guitarist Alex Lifeson, and notoriously press-shy drummer Neil Peart (pronounced “peert”, not the commonly mispronounced “pert”) are spread throughout the film, providing a revealing glimpse into what makes the band tick and how they’ve managed to stay together for more than 40 years and achieve a level of success that places them third behind The Beatles and The Rolling Stones for the most consecutive number of gold or platinum albums. Chew on that fact for a few seconds. The early history of the band is nicely chronicled, laying out how Lee and Lifeson, childhood friends, bonded over their misfit status and love of music, which eventually made Peart a perfect fit for the duo. Interviews with the band members’ parents add additional insight, including one particularly fortuitous clip taken from Allan King’s 1973 documentary Come On Children, where Lifeson (then in his late teens and known as Alex Zivojinovich) is shown arguing with his parents over the pointlessness of finishing high school, which he asserts will have no impact on his career goal of being a musician. It’s a compelling moment in the film, not for its unique viewpoint (how many times have we heard some variation of this story from artists? ), but for the fact it was actually captured indirectly by one of these artists for posterity. Mid to later periods of the band’s history are also given impressively in-depth exploration, with specific subjects and time periods fitting neatly into the thirteen chapters the film employs to tell its story. Two of the more notable ones look back at the band’s 80s deviation into more of a synth-heavy sound, which alienated many fans and led to creative tension between Lee and Lifeson, as well as the dark years that nearly saw the band pack it in, brought on by the dual tragedies that befell Peart in 1997 and 1998 (Peart’s daughter died in a car accident and his wife succumbed to cancer just ten months later). Peart’s willingness to address the period and even just his participation in the film is a testament to the directors’ ability to put their subjects at ease, given his reluctance to do interviews, especially on-camera sit-downs. The drummer, easily among the most legendary in the annals of rock and roll history, comes across as pleasant, shy, and a little guarded. He discusses his history of walking softly and carrying a big stick (or two), which, along with additional enlightening input from Lifeson and Lee on the subject, turns out is the result of being extremely introverted and having a major aversion to the concept of fan worship. An interesting aside: for someone so reluctant to be in the spotlight it’s fascinating to me that Peart has put so much of himself out there via his lyrics (he writes all of the band’s words) and numerous books, including Ghost Rider: Travels on the Healing Road, which was a remarkably honest chronicle of his struggles following the deaths of his wife and daughter. Lee and Lifeson similarly come across as very humble, nice people. The film also does a good job at showing the closeness of the band, which is as much attributable to their fiercely loyal friendships as it is their comfort level on a musical level. One doesn’t get the sense that there’s any trace of the jealousies and grievances that plague many long-time band members, which often results in separate plane or bus journeys and zero verbal contact until the moment they hit the stage. Another quality of the trio that might surprise non-fans is their sense of humour, which certainly doesn’t come across in their music. For anyone who has seen or read any number of interviews with Lee or Lifeson over the years this won’t be a surprise, though. Don’t forget that Lee sang with Bob and Doug McKenzie, and appeared on SCTV almost 30 years ago. Some of the more questionable fashion styles the band has adopted over the years (particularly the unfortunate kimono period) become comic fodder for the group to have a laugh at their own expense. Fan testimonials get a surprisingly spare amount of screen time, which was a wise decision by the filmmakers. Too many band docs that include such content rarely deviate from the uninteresting “man, this is my 79th time seeing them!” variety, although the conservative usage of it here still didn’t disappoint someone a few rows in front of me, who let out a huge “whoo!” when either himself or a Rush fan he knew was interviewed on screen. What elevates the film even more are the wealth of entertaining testimonials from the band’s peers and celebrity fans. Jack Black gets the biggest laugh with his description of Rush as “a band with a deep reservoir of rocket sauce.” Sebastian Bach also delivers some comic relief with recollections of how, as a 13-year-old metalhead, he felt obligated to read the work of Ayn Rand because it was a large influence on Rush’s 2112 album, and how he was further confused by what the hell this band was doing when they released some songs in French. Gene Simmons weighs in with his bewilderment at the band’s lack of interest in groupies when KISS took them out on an early tour. Some of the other notable names who talk about Rush’s influence on their careers are Metallica’s Kirk Hammett, Nine Inch Nails’ Trent Reznor, and Smashing Pumpkins’ Billy Corgan, who staunchly praises the band’s influence on music and their place in its history and bristles at their lack of respect from the music establishment. The inclusion of CNN anchor John Roberts, connected to the band through his Toronto music journalist past as “J.D.” Roberts, is a nice touch. Dunn and McFadyen continue to demonstrate an admirable talent for taking a subject they’re clearly passionate about and skirting around the margins of fanboy adulation to deliver a substantive, insightful work that also manages to entertain. In this case they’ve shown clear growth in their craft, producing an engrossing biography of Canada’s biggest musical export. This entry was posted in Documentaries, Film Festivals, Hot Docs and tagged #hotdocs10, music. Bookmark the permalink. Terrific review Drew…I may just point people to this instead of getting around to writing my own. I’ve always loved Rush’s sense of humour – particularly how it comes out in their liner notes. Occasionally it pops out in a song though…The album Presto had a song entitled “Anagram (for Mongo)” – not only did the lyrics show a humourous and clever touch at weaving together so many anagrams, but they managed to sneak in a “Blazing Saddles” reference into the title – and of course they had back to back albums with instrumentals entitled “Where’s My Thing?” and “Leave That Thing Alone”. Your point about Dunn and MacFadyen is one I noticed as well. They are very adept at sharing their passions without gushing or fawning over their subjects and have a better shot than most at entertaining an audience who aren’t already fans. Can’t wait to get my hands on the DVD which should have a whack of additional material. Picked up the Blu-ray of the film for less than $20 yesterday and watched it with Brooke tonight. We both thoroughly enjoyed it, and it reminded me that I’d bought a copy of Neil Peart’s book Ghost Rider for a friend almost ten years ago and kept it when I found out he’d already read it. Now I can’t wait to read it for myself. I was struck by just how decent these guys are, and although in a different class musically and intellectually, they reminded me a bit of the guys from Anvil. Must be that suburban Canadian grew-up-in-the-60s-and-70s thing that I share with them. Best part was seeing pictures of Alex in the Navy League Cadets, of which I was also a member. I won a trophy for Best New Recruit in 1976! But by that time, Alex was already making records with Rush. Also great to see all the old footage of downtown Toronto and some of the clubs (The Colonial Tavern, The Gasworks). I only wish they’d shown the beginning of City TV show The New Music, when they actually used the overture from 2112 as their opening music. This was before they used Pigbag’s song “Papa’s Got A Brand New Pigbag” and no one I know can remember. I guess I was just cooler, watching the show that much longer than any of my friends. Anyway, this DVD is packed with extra stuff, too, including several performances taken from some of their concert DVDs, so there is a lot here for the fans. The fact that my wife is now singing Rush songs to me shows that the film may even help convert a few people. I enjoyed some of the DVD extras as well, especially the “Being bullied” and “Search for the first gig” segments. I think you’ll enjoy ‘Ghost Rider’, James. It can get a little repetitive, but overall it’s a very interesting read.